The mystery to me is how this subject continues to get press coverage. In the 1970s, Dr. Walter McCrone examined a portion of the shroud that was purported to contain dried blood. He found no blood, but he did find red ochre and vermillion paint particles. Dr. McCrone, who literally wrote the book on the analysis of microscopic particles (“The Particle Atlas,” published in six volumes from 1973 through 1979), was eminently qualified to conclude that the shroud was a 14th century painting. The “scientists” who refuted his work had no qualifications to perform the analyses on which they claimed to rely. I have had several responses that say that my views are plausible or that i seem to be on the right lines so I can only sow seeds . One day I hope some expert will come up with the watertight evidence! I, too, would like watertight evidence. But I doubt it will be what Charles hopes for. Colin Berry has certainly demonstrated how weak Charles’ argument is. I also doubt, even with watertight evidence, that the belief it is a painting will ever fade – no pun intended, Charles. Nevertheless, the images are real enough! That woke me up this morning. I realized it is time to read or re-read, as the case may be, Shroud-like experimental image formation during seismic activity by Giovanna de Liso. 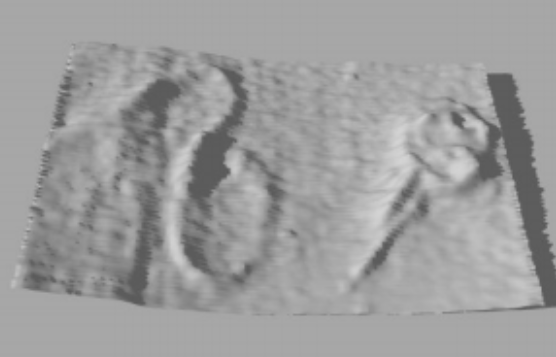 Seismic oxidative phenomena on vegetal structures and ferromagnetic rocks, occurring only along parallel surfaces to the ground, led me to verify experimentally if, naturally, in conjunction with earthquakes, it is possible to form images with a 3D character similar to Turin Shroud image, of objects placed between the two edges of linen cloths folded in two and soaked with different solutions. Some similarities with the Shroud image were obtained only on ferromagnetic rocks, during seismic radon emission, with electrostatic discharges and geomagnetic variations, in agreement with Lattarulo s theoretical hypothesis. Why did I not pay more attention when the paper was included in the Proceedings of the International Workshop on the Scientific approach to the Acheiropoietos Images in Frascati in 2010? Did it then seem too much off-the-wall? And now, not? During the past several days, I have noticed several comments with the phrases “resurrection process” or the “process of resurrection.” Why do we think the resurrection was a process? We are all familiar, at least in principle, with the way a caterpillar transforms into a butterfly. It is a process. We can make a time-lapsed movie of it and see each and every step. Some will say they see a miracle unfolding. Others will say it is nothing of the kind; it is a perfectly explainable biological process. If you were to take the first frame and the last frame from the movie of the process, splice them together and pretend that nothing happened in between then you could pronounce and demonstrate with a very short, two-frame movie that a miracle transformation had taken place without a process. The resurrection, if we are to believe in it, was a miracle. And if we are to take our knowledge from scripture alone, there was a before and after, a first frame so to speak and a last frame. There was nothing in between that we know about. So, why do we think there was a process? Why do we think, for instance, the body dematerialized such that a cloth might fall through it or that that the body might releases some form of energetic byproduct during the resurrection? Why do we think, as Mark Antonacci suggests that Jesus might have passed through a traversable Lorentzian wormhole in space-time or as Frank Tipler suggests that the process of resurrection might have been a form of electroweak quantum tunneling and the images on the Shroud the consequence of a Sphaleron field? 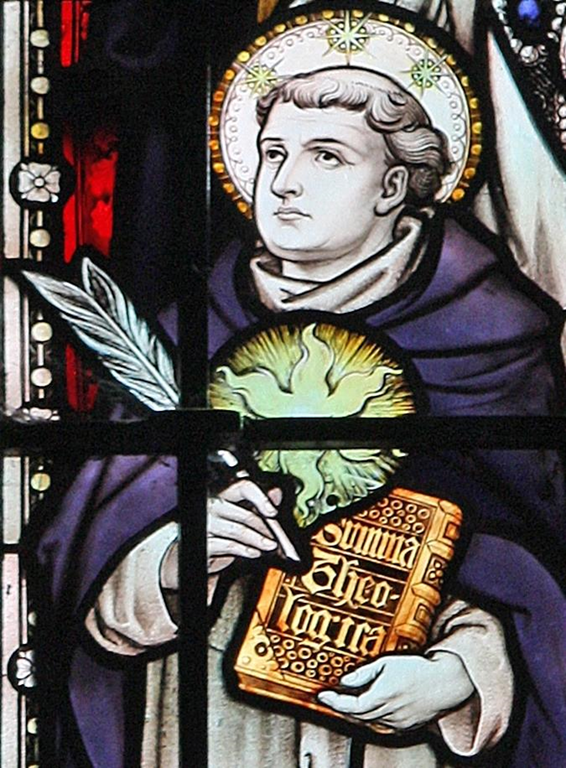 Thomas Aquinas in Summa Theologica tried to explain that angels in going from one place to another did not pass through the place in between. Nor did they consume time doing so. By this sort of local movement an angel may, at will, be present successively in several places and thus may be said to pass through the space between the first and the last place of the series. Or an angel may cease to apply its powers in the first place and begin to apply them in the last, not passing through the space between. Since there is succession, that is, before-and-after, in the application of an angel’s powers, now here and now there, it must be said that an angel’s local movement occurs in time, and is not instantaneous. This time, however, is not measurable in our minutes or seconds; these units of time are applicable only to bodily movement. For angels, at least in how they traveled, there is only a first frame and a last frame, so to speak. Thomas was much into angels and was brilliant at logical speculation. We can leave it at that. We don’t need to agree with the saint. Nonetheless, this notion of his provides a useful metaphor for pondering supernatural action. There is in his imaginings a change of state and no measure of time. Might the resurrection have been that way? What about other miracles? When Jesus healed the blind man was there a moment in time when the man’s eyesight was partially restored? 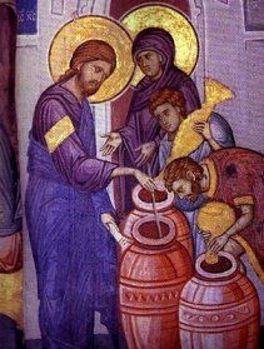 When Jesus turned water into wine were there moments in time, no matter how brief, when the wine was still mostly water and when – perhaps fractions of nanoseconds later – the water was mostly wine? Might the resurrection have been just a miracle with a before and after and no in between process? The problem, for us in the shroud world, is we need something to get that image on the cloth. Or do we? anywhere in the Critical Summary. 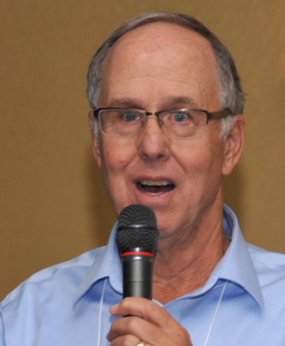 Bob Rucker (pictured) posted what follows as a comment last evening. I have added a link to a previous comment by Bob and some links to more information. 1) Neutron absorption in N14 in the shroud creates new C14 in the shroud that is identical to the original C14 in the shroud so that the C14 date is shifted from 30 AD to 1260 AD. The dating laboratories, not realizing that the shroud had been through a neutron absorption event, would have misinterpreted their result by assuming the wrong C14 decay curve. 2) The results reported by the three dating laboratories were not in good agreement with each other. Statistical analysis indicates only a 5% chance that their results were within their measurement uncertainty, so that the differences were probably (95% probability?) caused by something. Plotting their results as a function of the distance from the end of the shroud indicates that there is a slope or gradient of 42 to 57 years per cm across their data depending on the sampling done in Tucson. This slope in the C14 dates from the three laboratories agrees with the MCNP nuclear analysis calculations, which calculate that a uniform neutron emission in the body causes a neutron distribution in the tomb which produces just this range in the C14 dates across the sample region, so that the disagreement between the laboratory values is the result of the slope of the neutron distribution at the sample location resulting from homogeneous emission of neutrons in the body. 3) These same MCNP calculations predict that a piece of cloth placed on the side bench about a foot in front of the back bench where the body in the shroud was located would date to about 700 AD. 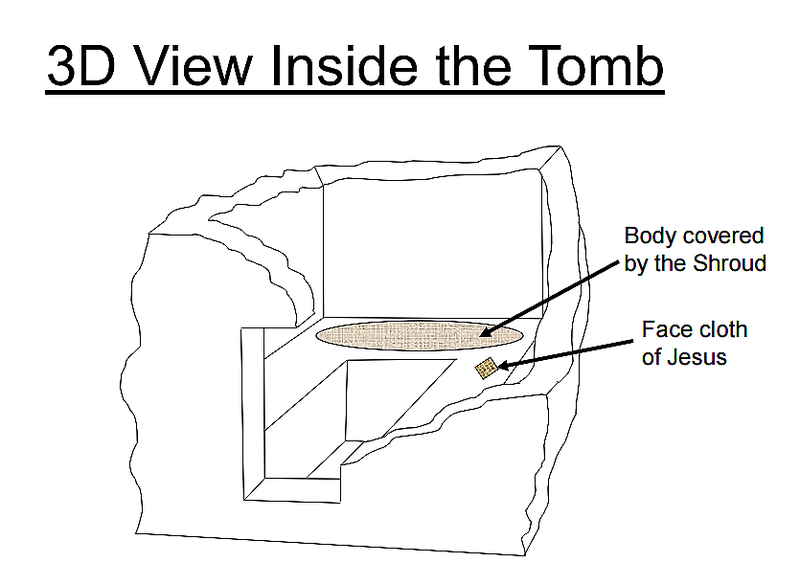 This location in the tomb is a natural location for the person working on the body in the tomb to lay the face/head cloth. According to tradition, the Sudarium of Oviedo is the face/head cloth of Jesus. It was C14 dated to 700 AD, in excellent agreement with the MCNP results. Neutron Flux: In the same issue of Nature that reported the 1988 radiocarbon testing results there was an important letter to the editor. This letter rings out today with possibly more force than when It was first written. It causes one again to ponder and adopt a position of caution. The correspondence was with Thomas J. Phillips of the High Energy Physics Laboratory at Harvard University. Phillips suggested that the Shroud might be a fundamentally altered fabric with respect to its C-14 content due its possible witness to some unexplained event, possibly in the tomb of Jesus. He hypothesized that such an unexplained event, which itself cannot be the subject of scientific inquiry, may have had an effect on the Shroud that can be studied scientifically. The unknown event may have generated a flux of neutrons that could have skewed the C-14 / C-12 ratio of the linen doth…..
With regard to the image I’m stuck in the “it is inexplicable” camp. You don’t like that? Well then you can consider Bob Rucker’s radiation, John Jackson’s cloth falling through a mechanically transparent body whatever that means, Tipler’s sphaleron quantum tunneling, Giulio Fanti’s corona discharge, Paolo Di Lazzaro’s ultraviolet (with or without the cloth falling through the body, Rogers’ Maillard reactions (quite natural if it could work but requiring every bit as much of a miraculous manipulation to produce such an image as any of the other byproduct of a miracle hypotheses would), Charles Freeman’s it’s-not-a-fraud painting (if STURP and Colin Berry are wrong) and Colin Berry’s fraud-by-Maillard if everyone else is wrong (which is not unreasonable to suppose). Or think of something else. As for the C14 question, I’m also stuck in the “so far inexplicable” camp. Here are some resources for understanding and thinking about Bob’s ideas. Fair enough. I stand corrected. I was probably unfair. We still need to crawl through the details, however. 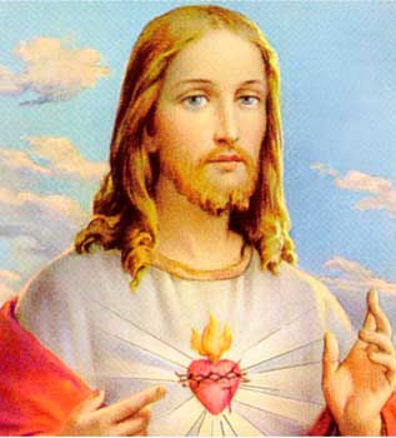 … does Jesus have blond or white hair? That doesn’t make a whole lot of sense if he was Jewish. Although there are no descriptions of what Jesus looked like in the New Testament, I think this would have stood out so much it would have been mentioned. The true explanation of the existence of Jewish blonds has been the subject of lively discussions among anthropologists. Some believe that it is due to climate and environment (Pruner, Bey, Pritchard, Jacobs), while others attribute it to racial intermixture, particularly to the admission of Aryan blood into modern Jewry (Broca, Virchow, Schimmer, Ripley, and others). Elkind shows that the color of the hair is independent of the cranial index. Virchow’s investigations show that in the eastern or darkest provinces of Germany the proportion of blond types among Jews does not decrease; whereas in the Prussian provinces, which are predominantly blond, the Jews show the highestproportion of brunettes, and in Silesia, where the non-Jewish population is of very dark complexion, the Jews have a high percentage of blonds. The same has been shown by Schimmer to be the case in Austria. Andree ("Zur Volkskunde der Juden," pp. 34-40) points out that the fact that red and blond Jews are found in North Africa, Syria, Arabia, Persia, etc., is proof that intermarriage has had little to do with the production of the blond type in eastern Europe. He is of the opinion that there were blonds among the ancient Hebrews, and that the modern red and blond Jews are their descendants. Luschan agrees in this view. Jacobs attributes the erythrism of the Jews to defective nutrition, and shows that it is present not only among the European Jews, but also among those in Algiers, Tunis, Bosnia, Constantinople, Smyrna, and Bokhara, where the presence of Aryan blood could not be admitted. However, it has long been recognized that the images of the hair, moustache, and beard are anomalous. Figure 26 (sic, should be 27, shown here) shows a slightly contrast-enhanced view of the area of the face and hair. The density of the image is greatest in those areas. That can easily be explained by the inhibition of vapor diffusion through a mat of hair. Ammonia is first evolved from the lungs; therefore, amine concentrations would have been highest in the vicinity of the nose and mouth (moustache and beard). Of course, this is assuming a diffusion model or something similar – a natural phenomenon. 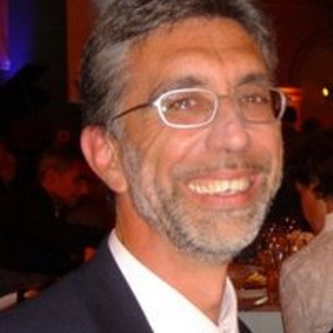 Over at Academia.edu, Paolo Di Lazzarro has posted an uncorrected proof of a paper, Non invasive analyses of low-contrast images on ancient textiles: the case of the shroud of Arquata by Paolo Di Lazzaro, Massimiliano Guarneri, Daniele Murra, Valeria Spizzichino, Alessandro Danielis, Arianna Mencattini, Veronica Piraccini and Mauro Missori. The paper is to be published late this year in in the Journal of Cultural Heritage. We present the results of the first in-depth measurements of the linen cloth of the shroud of Arquata, a precious copy of the Shroud of Turin, which dates back to 1653. 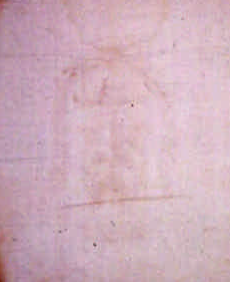 The measurements aimed at finding the nature of the faint and low-contrast body impressions on the linen cloth, which are not produced by drawings or paintings as in the other copies of the Shroud of Turin. In general, the optical analysis and the imaging of low-contrast stains on ancient textile is a complex task, due to the irregular surface and the influence of spectrum, position and uniformity of the illuminating source on colour accuracy and rendition, A correct evaluation requires a multidisciplinary approach. We used noninvasive technologies. 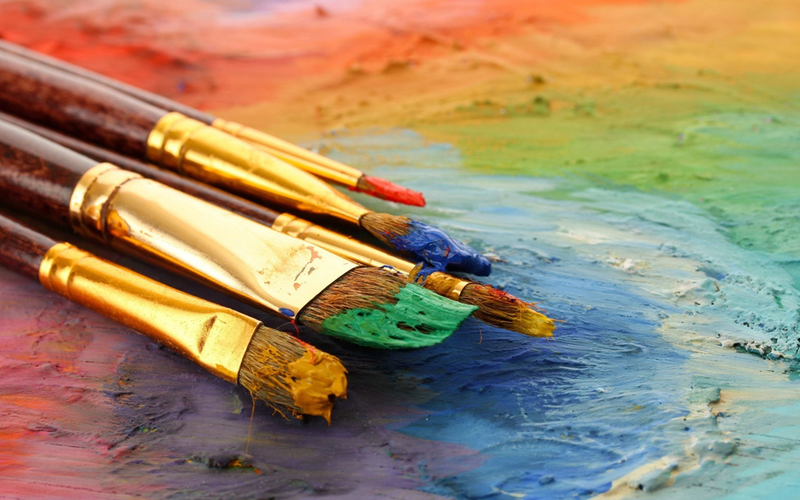 including imaging topological radar, laser induced fluorescence, absolute diffused reflectance and absorption spectra, which were previously used to study frescoes, paintings, antique papers, but were never exploited on ancient textiles. The combined results of our measurements and data elaboration allowed identifying the origins of the body impressions. of the stains simulating blood and of the other marks embedded on the linen cloth. Our results can be used to plan the proper long-seem conservation of the linen cloth and of marks on it.